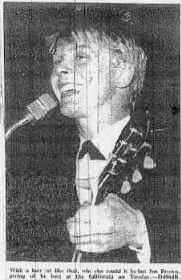 Pop Star Joe Brown, together with his group The Bruvvers, are coming to Dunstable next Tuesday. They will be the stars of a dance organised by Luton Round table in aid of the mentally handicapped. Supporting Joe will be three other groups, The Hide-A-Ways, The Fortunes and The Warriors. At the dance, which is being held at the California Ballroom, it is hoped to present the winner of the Round Table's recent "Win a Vauxhall" competition, with the car. Joe Brown Came With His "Bruvvers"
The blonde-headed guitar playing wizard from Lincolnshire, Joe Brown, visited Dunstable on Tuesday. 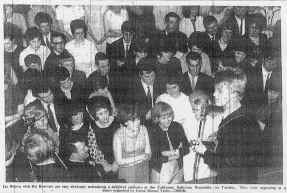 Along with his "Bruvvers", Joe performed at the Luton Round Table Ball at the California Ballroom. He showed what a versatile artiste he is to a disappointingly small crowd, who loved every minute of his power packed act. Despite his rural birthplace, Joe Brown has cockney character and wit that makes his between numbers banter almost as enjoyable as the songs and instrumentals themselves. He also has a tremendous talent for guitar playing and showed this to the appreciative audience by playing one number with the guitar slung around the back of his neck. He also proved that his talent is not restricted to electric guitars and pop music. He played the hymn tune "all things bright and beautiful" on the acoustic guitar and received a greater ovation for that than any other of his numbers. After his act Joe was called upon to make a presentation. He gave the keys of a shining new Vauxhall Viva car to the winner of the Round Table "Win a Viva" competition, Mr. Robert Webb, of 42, Kingston-road, (sic) Luton. Mr. Webb who works at Skefko Ltd. bought his lucky ticket at the Corn Exchange in January but never dreamed that four months later he would be receiving a brand new car and meeting well-known star Joe Brown. The competition had been organised by the Luton Round Table to raise money for the mentally handicapped. The four groups which performed, Joe and his Bruvvers, The Hideaways, The Fortunes and the Warriors, all gave their services for expenses only to help raise money.